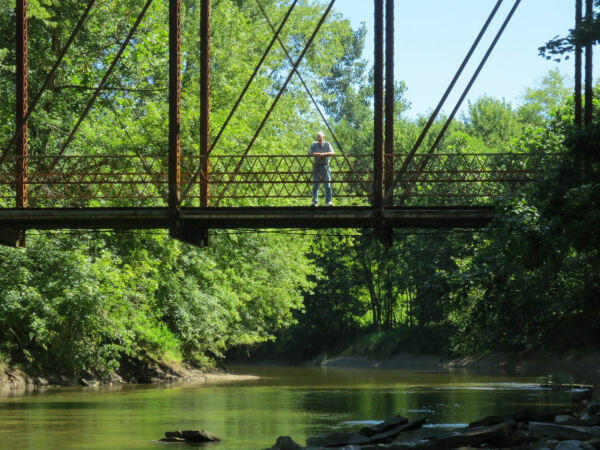 Some fishing trips are special because of the area, stream or lake you are visiting. Other times the trip was special and memorable due to the numbers or size of the fish that were caught. On this, one of the last days of July, this trip was special for me because I was able to bring my dad along with me. He is now 85 and as most great things do…he is starting to slow. Worst off is that he now questions his own ability to be outdoors; on this day I convinced him to come along with me on a trip to the Big Walnut to enjoy the nature and some great weather. My father, Ivan, was the one who started me hunting and fishing. I am not sure that he put the total love for the outdoors into me…I believe that was more of a God thing. Dad, however…was the one who always encouraged me and over and over told me to strive for the best. I still can remember the very spot when he and I caught a few smallmouth together. It isn’t too far from here and I still frequent that small stream on occasion. On this day dad would drop me off at one bridge and pick me up at the other. In between I was able to land a few good smallies along the way. The weather and water couldn’t have been more perfect. It was as they say, one of ‘those-days’ that I won’t soon forget. It was particularly comforting to get to the end of my fish and see dad sitting there, reading his paper, waiting and enjoying the beauty of the water. I do apologize for the wind and microphone issues on a couple of sections as the wind was blowing quite well. One thing that I have learned about my GoPro Session is that the sound is good if the wind is coming straight into or from straight behind…but not from the side. As I have said before…it is tough being my own camera crew? I hope that you still have your father…and if not, I hope that you have all the great memories you should. My dad and I are best friends…not everyone can say that. I am proud of him…and proud to be his son. If you enjoy the video…please give me a like. If you have any fly fishing questions …don’t hesitate to contact me.